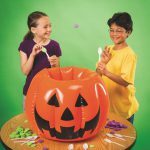 Halloween is such a fun holiday for kids to express their creativity. There are so many cute characters, like ghosts, spiders, pumpkins, and mummies that they can create using simple materials. 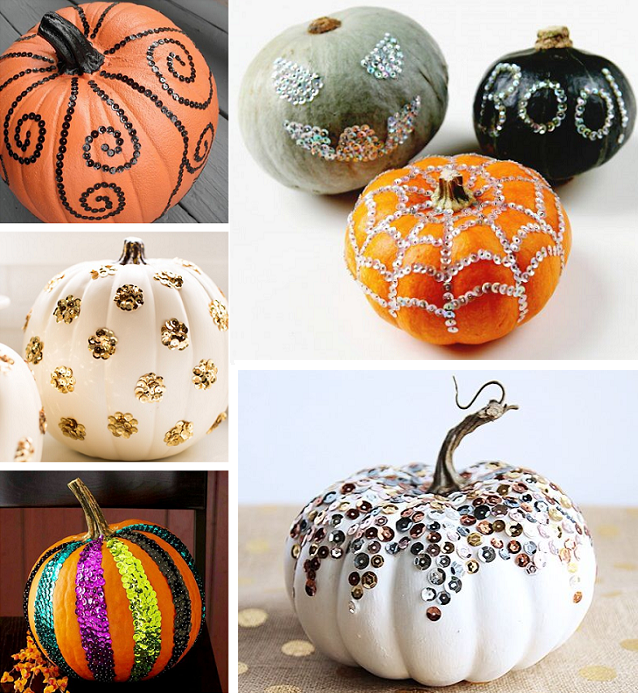 Here’s a list of our top 10 favorite Halloween crafts. You can also use them as fun decorations each year. Use our mini or large terra cotta pots to make your favorite Halloween characters! Put candy in them for a sweet treat. Bat: Paint the pot black. Glue wiggly eyes, then draw a mouth and fangs with white paint using a thin paintbrush. Cut out bat wings out of black paper using a template. Pumpkin: Paint the pot orange. Paint the eyes and mouth black with a small paintbrush or permanent marker. Frankenstein: Paint the pot green, then paint the very tip of the opening with black paint. Use black felt for the hair. Glue on wiggly eyes, then draw a mouth and scars with a permanent marker. How cute are these little spider webs? To make the web, paint 3 craft sticks (either regular or jumbo) with white acrylic paint. Glue the sticks together in the center. Wrap white yarn around the middle, then keep wrapping along the sticks until you get to the end and then tape the yarn to the stick. Cut another piece of yarn and tie it to the end of the stick so you can hang it up! To make the spiders, first cut small pieces of black cord for the spider legs (TIP: Wrap a small piece of pipe cleaner to keep the legs together.) Glue to the middle of the craft sticks. Add wiggly eyes to a black pom pom and glue to the legs, and a mouth out of construction paper if you’d like! There are so many options for these shaker cards! We chose to make a ghost and pumpkins. First choose your design. You can use markers, colored pencils, or crayons. Then put some craft supplies inside of the shaker related to your design. We used orange beads inside the pumpkin, and wiggly eyes for the ghost. Give the drawn pumpkins a 3D look too with black construction paper for the faces. Add glitter to the background of the ghost to look like the night sky. This is one of our craft kits that comes as a pack of 12. It’s a great group project for young kids because it is easy to assemble the foam pieces. The kit comes with everything you need, including a self stick magnet so you can hang it on the refrigerator. Use our Halloween Buddies craft kit to make felt pumpkins and spiders. The kit comes with 24 so it’s great for large groups of kids. Use tacky glue to put the felt pieces in place, and to add a ribbon or magnet so you can hang them up! You can also make your own DIY felt ghosts using white felt and wiggly eyes, and black string or construction for the mouth. See below for some different ghost shapes you can make! This craft kit called Boris the Bat comes with 24 projects. Kids can choose their own scratch art pattern for the bottom of the wings, and then add the felt head, body, eyes, and top wing which all have sticky backs for easy application. TIP: If kids want to add fangs, cut the tips of the ears off of the body, take the felt off, and glue the white paper to the head. Our Monster Spider craft kit comes with the pom poms, pipe cleaners, and 4 sets of fun crazy eyes! The instructions guide you step by step on how to assemble the spiders. You can also make a spider with jumbo pom poms! The pipe cleaner legs will stick right into the pom pom easily. Then glue wiggly eyes and a mouth (we used yarn). 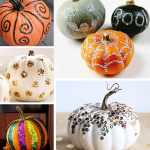 For the pumpkins, you can use both large and small pom poms. Put a brown pipe cleaner into the top for the stem. Then use black construction paper for the eyes and mouth. You can also use wiggly eyes. We love these Halloween mason jar characters. These are our favorite from masonjarcraftslove.com and there are so many other design ideas on Pinterest. You can either use spray paint or acrylic paint, and then add fun faces with wiggly eyes, construction paper, or marker. The mummy is our favorite – wrap the jar with strips of paper or gauze! A holiday isn’t complete without a handprint or footprint craft! 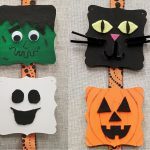 These are just a few ideas from Crafty Morning on how to make ghosts, mummies, and Frankenstein. Paper plate crafts are also super popular for holidays. Our favorite Halloween themed plate craft is this black cat from Crafts By Amanda. It’s so easy to make, and very creative. 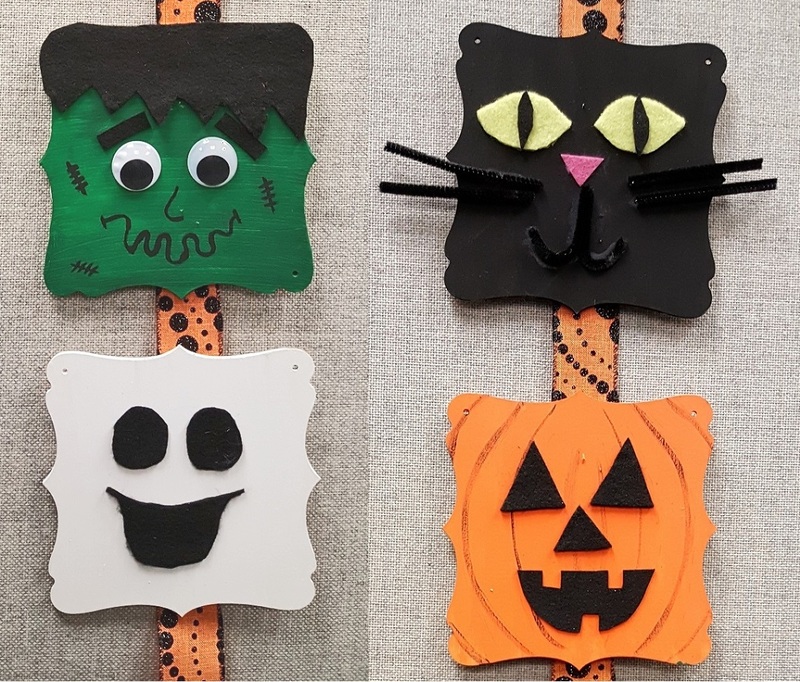 This entry was posted in Arts & Crafts, Fall Crafts, Halloween, Holiday Crafts and tagged bats, black cat, crafty kate, frankenstein, ghost, Halloween, halloween crafts, Holiday Crafts, mummy, pumpkin, spider by S&S Worldwide. Bookmark the permalink. Great craft ideas. Some days I wish I could be a kid again in Elementary school, but then such is not an option. 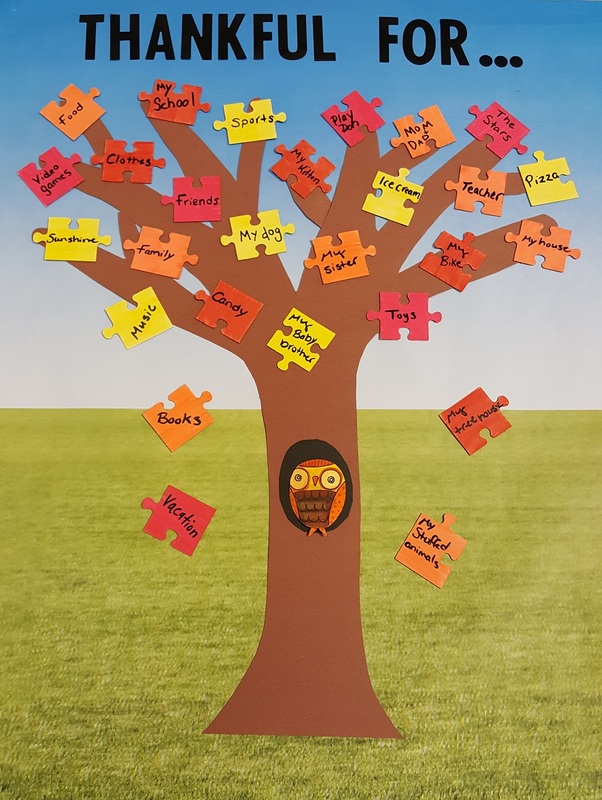 I love the way many schools now do fun stuff in classrooms as a way to teach and keep kids involved. My memories of the classroom was the three R’s all day and the teacher had a ruler in her hand. Ouch!